See the future of payments. Now. Argentas' HydraNet payment network is based on the advanced 'Architecture of Money' to enable global scale and speed, but its primary focus is on unsurpassed ease and convenience of use. Building the global HydraNet payment network with its native digital currency is a part of our mission is to make global financial services faster, cheaper, easier, more convenient and secure, and offer them with style and substance. Architecture of Money. Designed for the crypto era. We felt there was a hardly more suitable term to describe our designs for the blockchain-based financial platform architecture than the 'Architecture of Money' (AoM). In brief, it is the new way to see the world of money, payments and other businesses that are traditionally seen as banking. AoM will profoundly disrupt, deconstruct and recreate the world of money, payments and banking as we know them now. The end result in the end of the day will be dramatically different from the financial architecture of today - for the better. The Architecture of Money as an end-to-end solution will have three key dimensions forming a global DLT-based platform for payments and other financial services: the proprietary blockchain network with its native digital currency, the network bridge entities and interfces, and the decentralized applications (later phase of development). The core element of the ecosystem is HydraNet, the proprietary blockchain of Argentas leveraging advanced distributed ledger technologies, with its native digital asset facilitating global, virtually free and real-time transactions. The team will work on applications of lightning network for additional payment processing speed, smart sharding for less network load and eventually for quantum resistance. The HydraNet interfaces such as wallets and bridges forming a connection between the traditional and crypto economies such as banks, exchanges, payment firms and other actors play a key role in the ecosystem that is open to all and interconnected. Banks and other traditional players will gradually morph into network interfaces, as the bank accounts will disapper into the network that will be the global bank for everyone. Decentralized network applications, dapps, form the third dimension of the ecosystem focusing on adding value through technological innovation in payments, banking and other financial services, for which HydraNet is the perfect environment of disruptional transformation. Smart dapps will eventually replace many of the banking and other financial services as we know them now. A whole new financial ecosystem will emerge. The HydraNet blockchain will have 12 original hyper nodes, the ‘heads of Hydra’ to generate the genesis block and kick off the blockchain, which will then organically grow into n nodes of eventual full decentralization, just like two heads of Hydra replacing any head cut off. The node IP addresses will be obfuscated for further security so that they cannot be attacked. A Byzantine Fault Tolerant Hydra Consensus Protocol lays out the rules for the network operation, incl. eventual smart sharding for max scale. While the Hydra Ecosystem operates in a self-contained manner with its native digital asset or cryptocurrency through its native entities such as the native wallets and integrated decentralized digital asset exchange, the “bridge entities” connect the ecosystem with the traditional economy (eventually banks will disappear), and hold balances in non-native assets being digitized / tokenized for the blockchain operating as a global value transfer network, enabling transfer of any item of value. The HydraNet dapps leverage the potential of the HydraNet blockchain to provide decentralized products and services through applications that replace what banks, payment firms and networks, payment card schemes and other financial services providers do today in a centralized manner – the HydraNet dapp ecosystem will focus on financial applications to become the blockchain for global finance, while other types of dapps will be built on the enterprise platform. 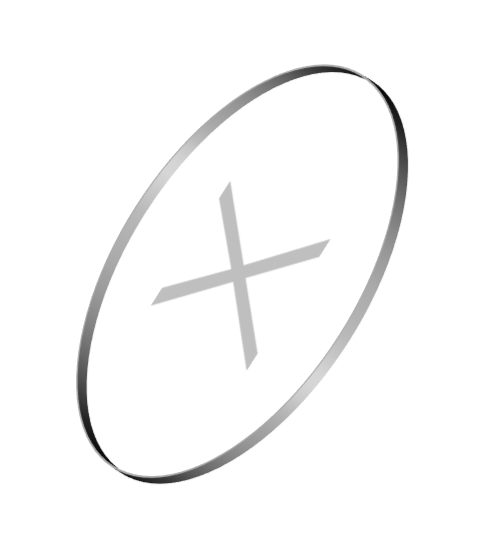 At the core of the HydraNet, there is the native digital currency tentatively called X. This next generation digital currency will embody the latest technologigal advances to become a true world currency, and digital cash for the 21st century that again respects the privacy and freedom of the individual. A mechanism has been conceived to promote the stability of the value of the currency so that it can really become the world's preferred payment currency, serving the requirements for the functional requirements for the store of value, unit of account and medium of exchange, the fulfilment of which can only create a world currency. The path to the future of money has begun. Fast. Global. Secure. Private. Ideal for payments. Making payments should be as easy and cheap as sending email. Making global payments possible. With blockchain. For the first time ever, truly global payments are possible. Before, the world was dependent on international financial messaging networks like Swift, old-fashioned correspondent banking across currencies and countries, slow clearing and settlement mechanisms, outdated payment card schemes and the like to effect payments across borders and currencies, all making payments slow and costly, but no more. Advanced next generation distributed ledger technologies underpinning blockchain platforms enable payments that are global and virtually real-time and free, settled and cleared simultaneously. Before, geographical and currency borders indeed existed for payments, but no more: Welcome to the new era in money and payments. The solution to global payment is not the creation of another 'paypal' on top of the existing financial architecture that is technically outdated and obsolete. A truly global payment platform can only be achieved via development and implementation of next generation blockchain technologies. This is not a game that the incumbent players or existing platforms can win: it is a totally new ballgame. Next generation blockchain. The real deal. While bitcoin introduced blockchain technology to the world, the first generation of blockchain and cryptocurrencies was more of a proof of concept with little real life use. Advanced next generation distributed ledger technologies (DLT) will enable applications that bring such technologies to everyday use. Argentas' HydraNet is based on them. The next generation platform is designed to enable global volume that will eventually be million transactions per second or more (vs. e.g. Visa processing ca. 60,000 transactions per second) and a global speed, with a sub-second transaction confirmation time that is essential for instant payments. 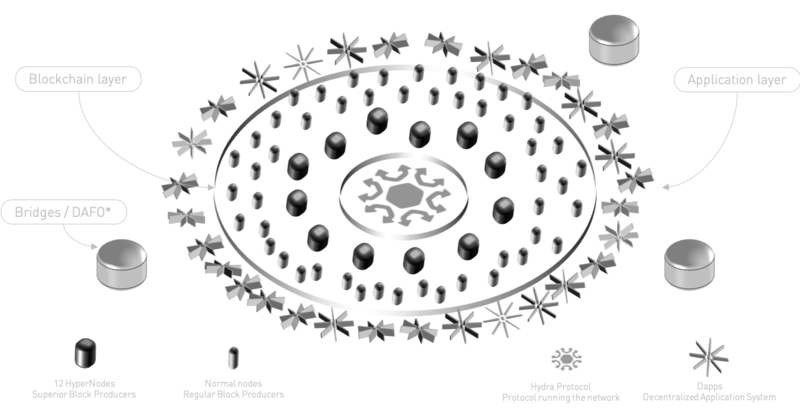 A key enabler for speed is the supernode structure, with the 12 supernodes or 'heads of Hydra' enabling fast confirmation times that with another structure of thousands of equal nodes would not be achievable. More powerful. Friendlier to environment. And cheaper. With the next generation DLTs it is possible to create platforms that are much more powerful than those of the first generation like bitcoin, and achieve that with much less energy consumption. Where bitcoin globally consumes massive amounts of energy, the new 'non-mining' DLTs consume only a small fraction thereof. The new technologies not only enable much faster transactions with greater throughput volumes, but do that all in ways that are much greener, much friendlier to the environment. More environmentally friendly means also cheaper: less power consumption enables cheaper transaction confirmations. This will make transactions on HydraNet virtually free. 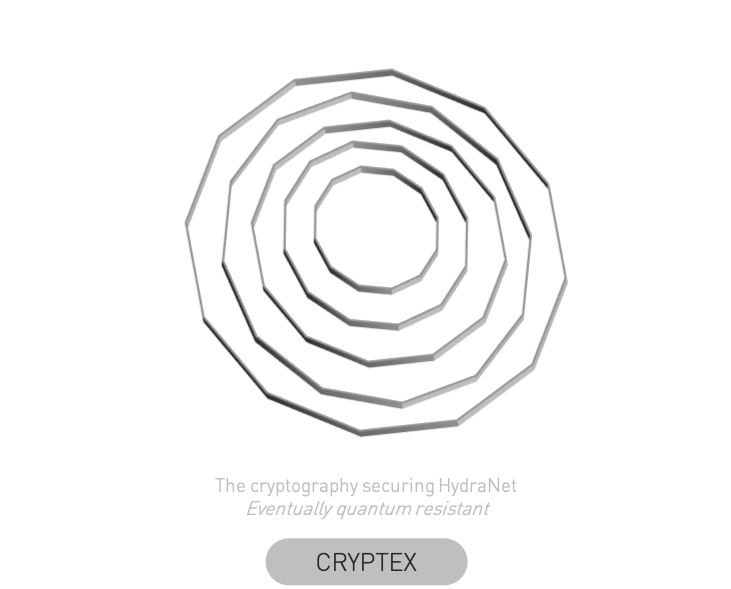 The HydraNet blockchain will be encrypted and protected by its "Cryptex" security mechanism that will be eventually quantum attack resistant - a risk that may not be yet relevant today, but will be so in the future. As of today, various cryptographic techniques and concepts exist that should already enable quantum resistance, which is a matter under constant international research and development. Equally, privacy and confidentiality of financial transactions is paramount and also a basic human right that has been breached by many governments and not only totalitarian ones. There will be an appropriate balance to protect the privacy and confidentiality, for which a number of strong tools exist already and more will emerge, and ensure that the transactions will be compliant with requirements, when they pass the bridge entities interfacing between crypto and traditional assets and economies. Ease. Convenience. Simplicity. Human design. Everything is designed to meet the human needs, and prioritize the ease, convenience, speed and security of the use of the HydraNet network interfaces i.e. wallets and other applications. Wallet apps will integrate with the smartphones' built-in features such as RFID proximity chips and barcode readers enabling pin, fingerprint or face-based payment transaction confirmations, so the power of the advanced blockchain platform will really be at the fingertips of the user. The project will put a particular focus on the design of the user interfaces and the overall user experience, to complete the proposition of having high quality inside out, a real 'apple of blockchain'. Simple, streamlined and elegant design will create a superior end-user experience and value added. Let's make this all happen together! Go to our Facebook or Twitter page and see, which of your friends follow or like us – they may have already signed up with Argentas. Submit a post on social media asking your friends whether any of them has invitations available for you.